A week ago, while I was doing my monthly shopping, I got stalked by bags of cranberries. Yes, those bags kept looking at me when I added to my basket carrots, leeks, beets, cabbages, onions, greens. Each time I put something in the basket, cranberries would appear either before my eyes or in the corner of my eyes. When I reached for turnips, my hand somehow piked a bag of cranberries instead. "Oh, well, if you insist I might do something with you", was my thought, and I added another bag of cranberries to the basket. 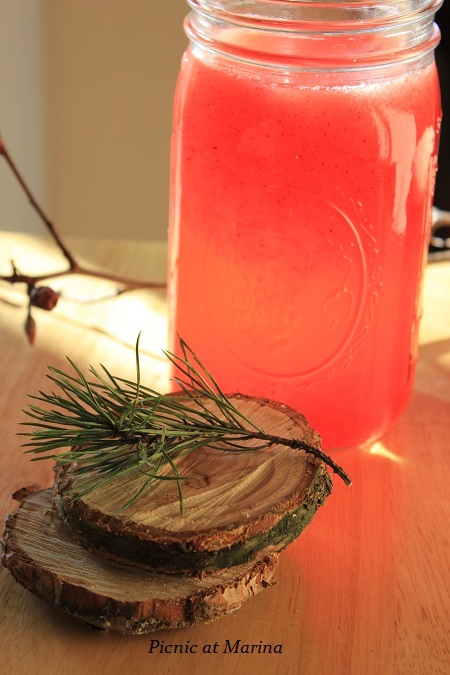 "Cranberries make a good winter drink, quick and easy, yet loaded with nutrients. It will make the teenager happy and help him fight his after practice thirst", I convinced myself. I came home, washed the cranberries and set it aside, still deciding what to do with it. I rotated produce in my refrigerator (something I forced myself to do a few years back, and now doing it on autopilot: saves a lot of food, not to mention money), and found a lone quince. As soon as I looked at it, I smiled and my eyes lit with this spark of adventure: I know what I am going to do! 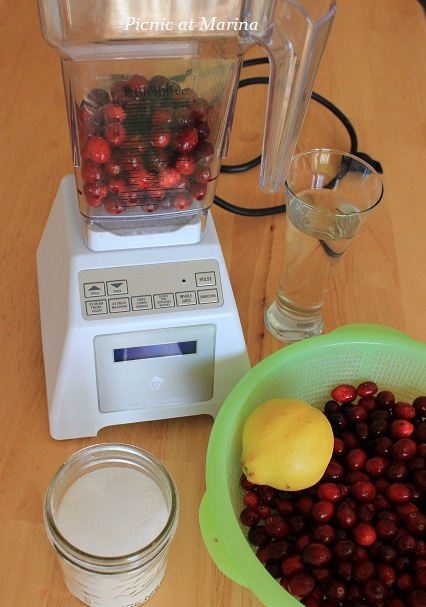 In a blender or food processor blend together washed cranberries, quince, and water. If you don't have any of the mentioned equipment, just crash the cranberries with the potato masher. Cut quince into a small cubes with the knife. Transfer all ingredients to a heavy-bottomed stainless steel or enameled cast iron 6+ Quarts pot. Bring it to a boil, stirring a few times. Add sugar, reduce the heat to a medium and simmer for 10 minutes, stir well. Turn off the stove, and let it rest (uncovered) until it cools down (2-3 hours at least). Bring the mixture to a boil again, stirring frequently (to prevent scorching), reduce the heat to a medium and boil for another 10 minutes. Transfer hot preserve into a sterilized pint (500 ml) jar (s), leaving 1/2 inch from the top, wipe the rims of the jars with a clean damp cloth, close with sterilized lid. Let the jars cool completely (I usually leave it overnight), and refrigerate. Whether you like it with turkey on your sandwich, or as a dessert with your tea (my personal preference), this cranberry preserve (sauce) would be another homemade addition to your pantry. Two teaspoons dissolved in a cup of hot water will make a perfect cold remedy, loaded with vitamins and fiber. I get stalked by stuff at the market all the time! Kinda fun, actually. ;-) Great idea for preserves - really like this. Thanks. This preserve looks quite good, it as a beautiful color! Thank you Kim. I love the color too. I think next cranberry season I'll make more of this preserve, it makes great topping for cookies and filling for cakes. We just never get fresh cranberries here. Sometimes we can get frozen but it's hard to find those too! It looks like a lovely, smooth sauce Marina! Beautiful color. Oh yes, I get stalked at the food markets just about on every trip. Go in with intention of getting a few items and end up with many items that were not on the list. I know that filling, have some experience of my own in that "department" :) I do try to restrain myself from buying perishables in big amounts though. What a beautiful color it is! I bet it would be so good on crepes...YUM! This is the 2nd post involving quince that I've come across in as many days. I need to get to my fruit market and see if they've any quince. I've not seen them but, then again, I've not been looking for them. I'm pinning your recipe, Marina, so that when I find them, I'll be ready. Thanks for sharing your recipe and serving suggestions. Quince is a popular fruit in the parts of Europe where I come from. 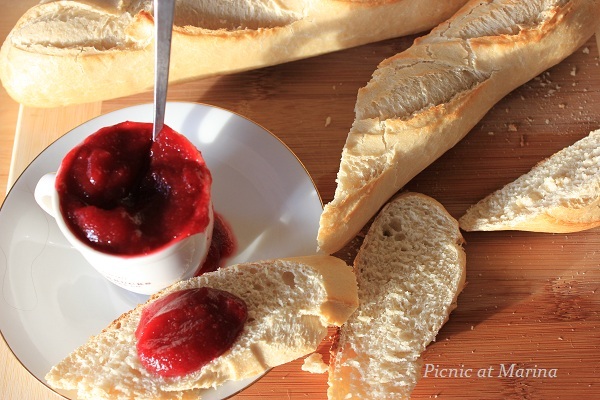 My mother makes a delicious and fragrant preserve just with quince. Because I had just one quince, I used it with cranberries. I also use quince when I make turkey for Thanksgiving. We were just discussing jams at breakfast...and the ordinary raspberry and strawberry are too sweet for my taste. 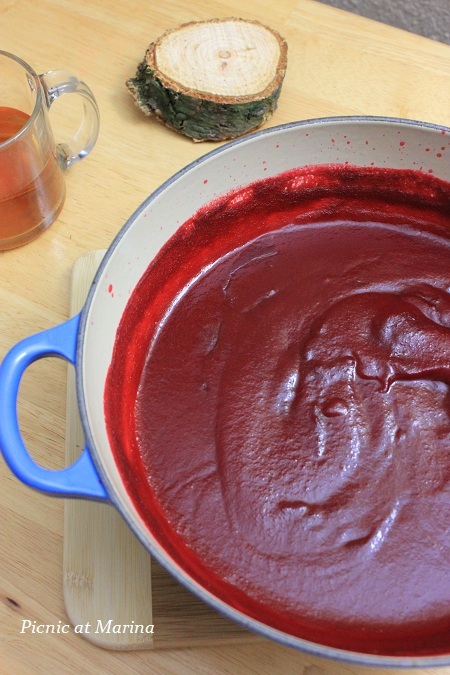 BUT your wonderful cranberry quince preserves would be perfect...plus the color is just plain gorgeous! Thank you Lizzy. I was amazed by color myself, as I took those photos late at night. That looks so good!!! I love cranberries they are so good for you! I actually take cranberry tablets because they are hard to get here and they help with some of my minor health issues. Oh my! This looks so good! On bread, in a cut of hot water like tea. Yes. Granny Smith apples OFTEN stalk me. And win. Concord grapes do the same to me when they are in season and available. As a crazy preserver, I am always in search of new ideas and yours is definitely original and looks particularly flavoursome. I also don't preserve much in winter, but there are certain things, like cranberries, that cannot be put into jars in other seasons. Splendid idea! Thanks Averie! I would like to have some of that drink right now as I am so cold! We are in Seattle, where my husband is having a job interview, and the weather is not particularly warm and sunny. I forgot how rainy and cold it could be up here! :) I would't mind even a cup of coffee! Dear Marina this preserve looks delicious...I love your story and how the cranberries have 'decided' to come back home with you!! I only think of preserves in the summer. But what a lovely idea to enjoy winter fruits. Thanks for sharing it looks delicious! This preserve looks so good Marina...van you believe that I never had quince? Nothing like homemade preserve. Beautiful pictures as well. Thank Julianna, we did enjoy our week indeed, although it was quite busy. We were in Seattle, the city of fun, fish, and friends. It was a business trip but we were able to see many of our friends too. Now I am getting back to normal slow paced Southern life. :) When you see a quince, buy it and try: it has a lot of flavor and can be used in sweet and savory dishes (I use it to stuff turkey for Thanksgiving dinner). I do preserves all year around, now I am in vegetable stage-)) Looks absolutely scrumptious! Marina, winter is a very good season to make some jams. Lemons, oranges, cranberries - very healthy and delicious. I love the combination of your ingredients. Very good! I do preserves mostly with summer fruits that I love! I love the color of your preserves Marina and I bet these will not last long either! Damn, I wish I could get stalked by bags of cranberries. We only get them over Christmas here and they sell tiny little punnets of them for vast quantities of hard-earned cash. About €4 for a tiny tray of them (about 100g I think). I can't believe you have quinces already? Don't they have the most incredible aroma? Wonderful looking preserve - I can just imagine the flavour... I bet it would go great on my morning oatmeal! Hi Charles, I am sure the once that you see in the stores are wild. Here, in US cranberries are cultivated. They taste different from what I am use to, but still very good. When we lived in the Arctic North, we ate wild cranberries, that I was buying from local people. Oh, they tasted good! Hi Marina, I've been so out of touch with my favorite blogs, and especially my blogger friends in the last couple months. I missed you and your fabulous blog. I thank you so much for your caring and kind words...it has meant so much to me! Hi Elizabeth, I was thinking of you wandering how is everything going after you had that surgery. Glad to see you here! And glad to hear that you are doing much better. Please, do take care of yourself! I made two varieties: one with berries and the other one completely blended. I need to tell you that I like with berries one better too. Although this one was perfect on cake. this looks lovely. how vibrant the colours are as well! i want this on crusty bread! I love the idea of this jam and anything with cranberries, this would be brilliant to add to just about any dessert!